One of my all-time favorite writers and people, the beautiful and outrageously talented Mallory from Serial Drama, sent me a link tonight that I’d like to share with you for about a thousand different reasons. It’s an interview Vulture did with actor Armie Hammer, who’s currently gaining massively deserved critical acclaim for playing not just one but both of the Winklevoss twins in The Social Network. As many of you know, Hammer was cast as Batman a few years ago in Mad Max director George Miller’s Justice League movie for Warner Bros., which ended up getting canceled during pre-production but got as far as the actors being fitted for costumes and trained in all kinds of awesome combat arts. This tells us several things about the Superman movie. For one thing, it brings the already fishy “Clark Kent is a journalist traveling the world trying to decide if he should, in fact, even become Superman” plot summary even further into question and doubt. And, as both Vulture’s interviewer and our girl Mallory pointed out, if they’re going for someone as old as 40, it certainly does bode well for all the wishlists (including mine) that have 39-year-old Jon Hamm’s name at the top. 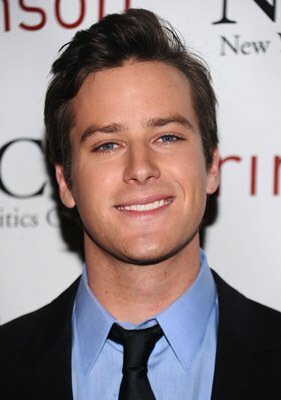 But let’s just say that Armie Hammer does end up getting cast as Superman. I wouldn’t have a problem with that at all. As usual, it’s up, up and we wait. In the meantime, thanks so much to Field Agent Mallory for pointing this out and making my day in all kinds of ways. DC’s new Batman era begins! Now with less Batman! Armie Hammer was also great in a guest role on Reaper. He played the very handsome (natch) son of Ray Wise’s Lucifer. And yes, I’m proud that I remembered that without having to Imdb it. You are a pop culture scholar — I’m not surprised you remember that at all! And I think that picture is actually from the Reaper appearance.